Now for the fun part! You've watched the submissions be whittled down to the top 16 and now is your chance to weigh in. All of our finalists have had the chance to iterate on their maps and feedback so be sure to give them another close look. A total of 38 maps were submitted to this category. For this category, judges focused on the ones that truly promoted macro play and had interesting layouts throughout the entire map. Treachery has shown some good games in the TLMC and will continue to show great games if you decide to vote for it. The map itself is not too large where it will promote boring split maps, and effectively uses gold bases to where they are an option not a requirement. 16-Bit is a retro red vs. blue digital landscape that has a few unique components differing from traditional macro maps. A pocket natural and destructible rocks at your forward natural allow for both aggressive and conservative play styles and ways to counter both. There are multiple attack paths and different expansion patterns. Give this a vote if you like macro maps that can play out differently every time. Updated the lighting to be brighter than before. Removed the rock tower from the 3rd (Destructible rocks remain). Added Xel'Naga watch tower, to the far edge of the outer high-ground area. 3rd's as well as some low-ground areas. Added an additional ramp into the vertical 3rd option, from the primary path through the center. Adjusted the 9/3 a'clock bases to have a larger area and ramp. The biggest issue the map had was the power of siege tanks regarding one of the potential thirds and the natural base, which was fixed in the iteration phase. The non-linear expansion pattern that makes the map unique has already proved to be balanced and able to provide nice games. So, there wasn't a real need for a lot of changes to the layout in general. A total of 42 maps were submitted to this category. In this category, the judges looked for maps that were well-executed or gave us slight deviations from what we're used to. This map merges the overall geometry of Catalyst with the aggressive central valley of Frozen Temple, with the addition of 4 large rocks that can significantly open up the main attack lanes later in the game. Vote for this map if you like Catalyst (you probably do, right?) and you want to keep playing it, because this is probably the closest you're going to get. Looks a hell of a lot better than that boring desert, too. Vote for Fracture if you want a standard map with a unique feel to each quadrant of its bounds. Also, all the cool kids vote for it, so I've heard. Main ramp adjusted to be more properly wall-able for Protoss and Terran. No-fly zones removed, large Hive made shorter to compensate. Overlord pods made more clear. Vertical third is now easier for defending armies to position around. Rocks added to the ramps heading to the bottom left / top right bases to help defenders. Center snow pile made smaller. Natural mineral line rotated to horizontal. Rocks added between the diagonal thirds to help in defense. Updated the texturing at the natural base to be more distinctive from the low-ground. Updated the decoration on the overlord cliffs to not entirely conceal the actual location of the cliff. Widened the central low-ground area, while slightly reducing the area on the central high-ground areas. splitting it down the middle. Made the terrain more conducive to reapers in a few areas. The map may be as standard as can be, but the technicality of the high ground pathways offer a nice twist to the way you can position your units both defensively and offensively. Taking control of key choke points around the map can offer unique advantages, rather than the usual straightforward map designs we've seen in the past. Plus, lush is good. Slightly increased the size of the main bases. The rocks in the natural base (to help with wall-off) were fixed. Increased the proportions of the 9 and 3 o'clock bases. Most concerns centered around these bases being very chokey later in the game and giving Zerg a hard time attacking and defending. Increased openness in various parts of the map, particularly around the watch towers and outside the natural bases. Decreased the amount of LOSB. WinterStarcraft didn't like that you could hide a thor in them. Reaper cliffs added to the mains. Regarding the linear thirds on lowground, the highground plateau base nearby had its ramp pushed back 2 hexes to keep siege units from being too overpowered from attacking down into the third base. In doing this, the openness around the third base was also increased. Increased the number of highground cliffs for overlords from 2 to 8. Several mineral lines were re-configured to allow smoother mineral gathering. Pathing was fixed in numerous places, and some doodads that were floating in the water were fixed. Map bounds were increased to correct any in-game camera issues. The only issue this map had was the lighting. It made the map look cool and unique, but also changed colors that probably should stay the same, such as the colors of health bars. There lighting was therefore changed back to normal, and the texturing was made unique in return in order to still have a fresh looking map. The rest of the map layout was kinda flawless in the first place; therefore, no changes were necessary. Fixed lighting, returning to very normal lighting. Texturing made more unique (3 Textures were replaced). The 6x6 rocks right in front of the natural were moved by 1 unit to fix a pathing issue and to open up the choke a tiny little bit. This is a standard map. It's got some nice colors on it too. Changes are intended to further encourage army movement away from the center of the map, to make the 4ths easier to take, and to remove a couple annoying siege positions. 19 maps were primarily submitted in this category. For Rush maps, we looked for maps that weren't just smaller scale versions of standard maps. In general, a combination of creative ideas and execution on those ideas dominated this category. Vote for Arashi if you want to see what a rush map without gimmicks and a reasonable rush distance looks and plays like. Lots of eyecandy, too! Natural mineral line changed to be anti-cannon, and to allow for walls to be made in ZvZ. Many ambient noises turned off, large towers lowered, and no-fly zones removed. Many of the pew-pew turrets in the middle of the map were removed. Base placement circles were changed to be less ugly. This is the map formerly known as Cybros Relay Station. themusic246 (creator of 16-Bit) offered this beautiful reskin and I was happy to accept. This map has plenty of aggressive potential due to it's relatively small size, but you aren't forced to play that way as the terrain at the third bases can let your defensive play speak for itself. Games here will likely not play out to super late game, so vote for this map if you like to rally units across the map or defend until you can make a decisive push. Dreamcatcher has a relatively short rush distance, but players may use the collapsible rocks to divert the main attack path. With a rare type of symmetry and a reasonable size, Dreamcatcher would be an interesting addition to ladder in the age of giant macro maps. Four rocks were added near the center of the map. The gap between the rocks is big enough to allow large units like Archons to pass. Cliff walls near the middle and by the golds were extended to create additional choke points. There were 25 maps submitted in this category. For New maps, we focused on ideas that we felt would truly change how the maps played. Maps were excluded for a variety of reasons, including execution, not introducing any particularly new features, and being too obviously imbalanced. The airblockers got fixed, meaning air units now can not get stuck in them anymore. It is now more visible where there are air blockers. Also a small air path between the naturals was openend up to give the watchtowers a lot more importance, so the map actually works now as intended! Added a small "air" path between naturals. Made undroppable high ground more clear to be undroppable. Added more air space behind the main. The backdoor gold base poses an interesting problem: not only is it extremely vulnerable to harassment, but mining it out opens a direct attack path straight into the back of your main. Are you willing to take the risk? Vote for this map if you think I deserve a good slap in the face for making it, just like its namesake. Vote for Travincal if you want to see interesting LOS mechanics apply to various stages of the game, including air fights, whilst still being allowed to play your regular macro game. Also, it looks like Act 3 in Diablo II, which is pretty awesome. Double rocks removed outside natural. Many ramps widened or altered to improve flow. Non-standard ramps near triangle third fixed, can be creeped and are now unbuildable. Center changed to be wider but partially blocked by 6x6, for opening in mid or later game scenarios. Treasure Goblins fixed placement in main. Vertical third chokes improved for the defender. 12/6 oclock bases removed, area around that highground region widened. Space added behind vertical fourth to deal with liberators. At the end of the day Blizzard gets final say on which maps make it into the ladder pool but this is our chance to send a strong message! Vote for your top five and let them know what you'd like to see. Just as last time, all the finalists have already won $100 for making it this far but we have some extra prize support from Blizzard to hand out to the top five. This season, we'll be retaining the voting structure of TLMC9. As before, instead of just selecting your favorite five maps, we'll be asking you to order/rank them as well. Your favorite map will receive 5 points, your second favorite map will receive 4 points, etc... 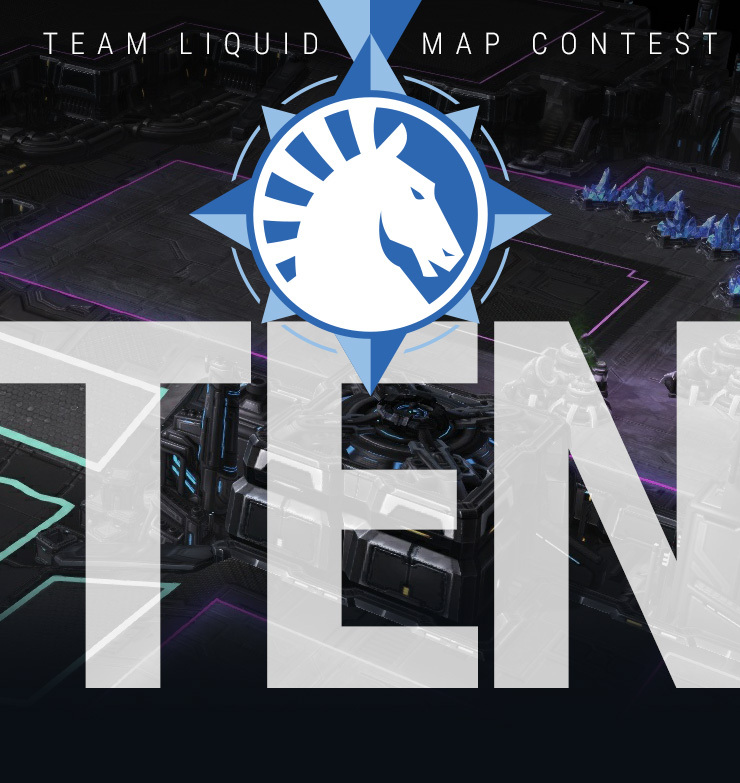 Thus, the map that has the most points, not the most votes at the end of voting will win TLMC10. Additionally, you must comment in this thread for your vote to count. A simple "voted" will do. Of course, we encourage you to post which maps you voted for and to have a discussion about which maps you like best as well! You have until Friday, Mar 16 6:59am GMT (GMT+00:00) to cast your votes for your favorite TLMC maps, after which the winners will be announced. Voted. There were tons of great maps this time around. Wasn't a huge fan of the maps this time, so I really struggled with my fourth and fifth choice. The post iteration versions of the maps will be uploaded shortly! After that I kinda ran out of maps I really wanted. Treachery is solid (though a bit too big), but I could really just do without dark tilesets. I would have voted for Blueshift if Catalyst wasn't on ladder right now, so instead I played meme roulette for the 5th and ended up with Dreamcatcher. Friendly reminder that Wardii has kindly uploaded all of the TeamLiquid Map Contest Wardii Tournament Vods! Props to themusic for putting the work into making Cybros look much better. Backpfeifengsicht isn't great, but we don't need more giant 2p maps on ladder.